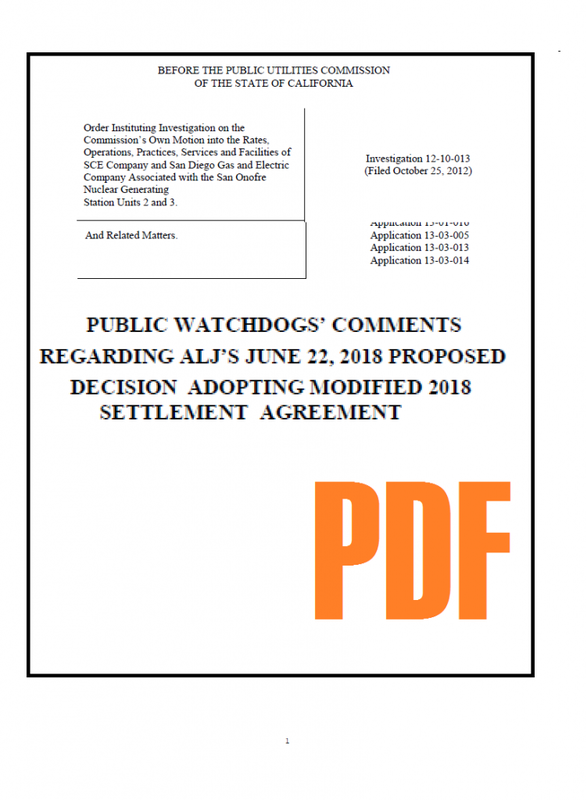 The nonprofit public advocacy group Public Watchdogs has just filed a 19-point legal argument against the publicly-funded bailout of the failed San Onofre Nuclear Generating Station (SONGS). If the proposed out-of-court settlement is approved it will complete an alleged criminal conspiracy to bail out Southern California Edison (Edison) at ratepayer expense. The proposed settlement delivers a 417-fold return on investment for Southern California Edison, which is paying the local law firm $5.4 million dollars in exchange for allowing Edison to keep billions of dollars that have been wrongfully charged to ratepayers. “What they are doing is like the police telling you that they are forcing the thief who robbed you to return 15% of what was stolen,” says Charles Langley, Executive Director of Public Watchdogs. “It is $5.4 million sell-out, and if it is allowed to go through it sets a precedent for utilities to buy the cooperation and endorsement of alleged consumer attorneys in exchange for legitimizing an illegitimate process,” says Langley. The legal protest, filed with the California Public Utilities Commission yesterday, asserts that approval of a the proposed bailout of Southern California Edison’s failed nuclear power plant represents the completion of a documented criminal conspiracy to defraud California ratepayers. It also asserts that the payment of $5.4 million to attorneys for the putative activist group Citizens Oversight represents an illicit compensation scheme that sets a precedent for large utilities with unlimited legal resources to purchase the silence of groups opposed to the documented unlawful activity that has occurred at the California Public Utilities Commission.